Winner at the NCCPE Engage Awards 2016 in the Individual-Led Projects category. This project carried a serious message, rooted in research, about sustaining healthy eyes via healthy eating. But it was also delivered with a sense of fun in the way it engaged with patients using cookery classes. Eating for Eye Health is a project which highlights the potential benefits that may be associated with eating food high in anti-oxidants to protect the retina from the eye condition, dry age-related macular degeneration. Led by Dr Rosie Gilbert, it engaged a group of older patients in a cookery session which highlighted the potentially positive benefits of eating foods rich in anti-oxidants. The ingredients included colourful foods such as butternut squash, kale, yellow and orange peppers, and broccoli. Patients also enjoyed the experience of cooking together and sharing their experiences, with many patients facing the prospect of having no medical treatment options available to them. The project was led by Dr Rosie Gilbert, a clinical research fellow and PhD student at University College London (UCL). It was delivered with the help of a grant via UCL’s Public and Cultural Engagement team. It was delivered with the help of a Community Kitchen at Manor Gardens Community Centre in Islington. Further support came via a clinical and research nutritionist, Susana Irving, from the University of Porto, Portugal. Encourage older people to cook and eat food that could support eye health. 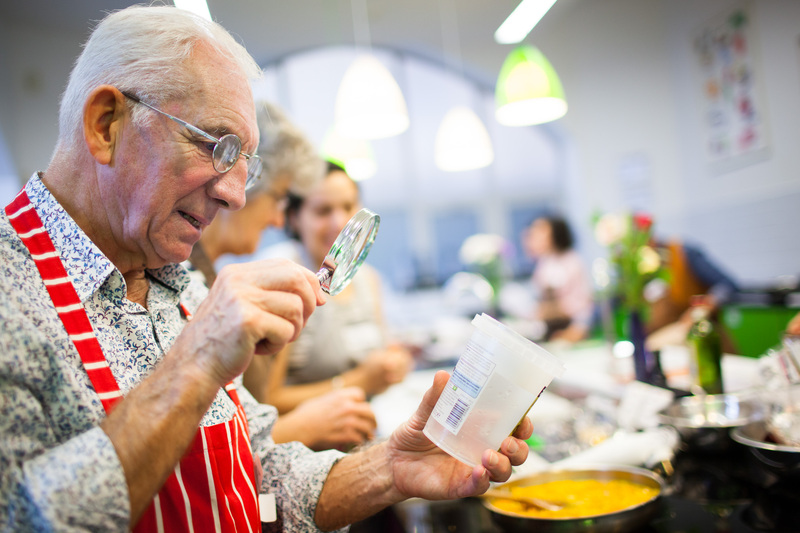 Engage participants in the enjoyment of cooking together and eating anti-oxidant rich foods which might benefit eye health, all carried out in a local, community and sociable environment. Dry age-related macular degeneration (AMD) is believed to affect more than 600,000 people in the UK alone. It progressively damages the central vision and is one of the leading causes of untreatable blindness. As there are very limited treatment options upon diagnosis for sufferers of dry age-related macular degeneration (AMD), patients are often discharged and while there is some support in the community, they can often feel isolated. Current scientific evidence, in particular the AREDS Clinical Trials, sponsored by the United States National Eye Institute, supports the recommendation of including extra vitamin and minerals into the diet as a strategy to tackle disease progression. Although these can be achieved with specific antioxidant supplements, we also know that these key nutrients can be found in brightly coloured foods, which may be enriched in the diet. The project initially engaged members of the public in a focus group organised with the help of the Macular Society (patient charity), together with Moorfields NIHR’s mailing lists together with verbal invitations to patients as they visited the eye clinics. Following the focus group, and based on recommendations made then, a community cookery day was held when around 10 patients spent time with clinicians who raised awareness about how diet and nutrition influence health. Patients were also shown how to prepare food to optimise the absorption of nutrients. Participants in turn shared their views on how their eye problems have impacted their lifestyle, their thoughts on the changing trends in diet and nutrition and what they perceived as barriers to changing their lifestyles. They told the project team about their interest in participating in a community kitchen project and filled out a short questionnaire about their diet. At the community cookery day, the public participated in a ‘Food Bingo’ activity, followed by the main activity of cooking a three course meal, including a food tasting of so-called ‘superfoods’, before eating the meal together. There was a positive response from participants of the focus group in terms of acquiring new knowledge from the talks and willingness to participate in a further cookery day activity. All the participants said they enjoyed the healthy meal they cooked together as part of the community kitchen activity and the majority of the participants claimed to feel more confident about their own confidence in cooking after the activity. The evaluation responses received on paper and photographs taken at the Cookery Day are evidence that the participants derived value from the project. Video footage was captured and includes interviews with participants talking about the need for the project and their participation in cooking activities. Positive feedback emails were also received, in addition to a patient letter in response to an article in the Macular Society’s ‘Sideview’ Magazine Spring 2016 edition about the project. The project uncovered an unfulfilled need amongst patients to engage with clinicians and each other about nutrition for eye disease. The UCL PhD research students from the Institute of Ophthalmology, who are doing basic research on eye disease, found the opportunity to interact with patients who had eye disease to be valuable because it added a personal perspective to their work and helped them to see that their research could make a tangible impact on people. The project also showed the importance of engaging with the public as a way to inform and develop further research in this area. The most successful ‘marketing’ method was through the PPI/E team at the Moorfields NIHR BRC because they are committed to supporting the best patient care at Moorfields Eye Hospital and they have well established infrastructure for patient engagement, including mailing lists of patients who have registered their interest in involvement in research. 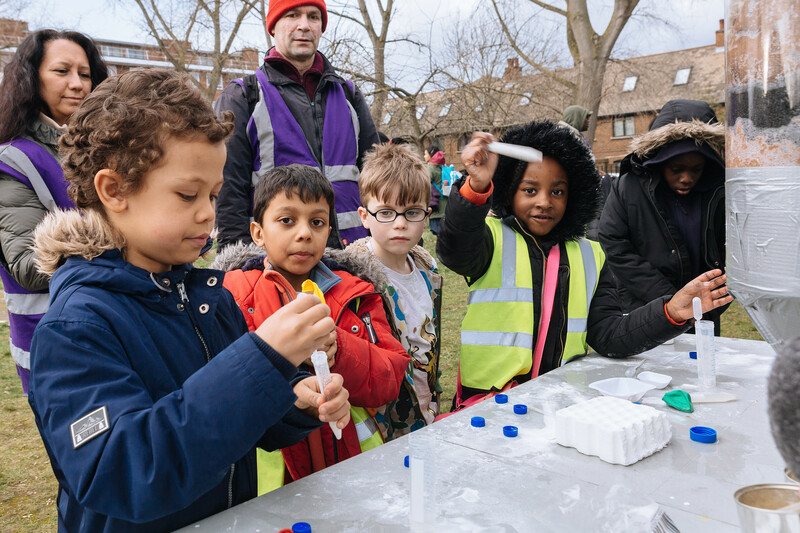 This project has demonstrated the value of engagement with research on diseases where there are limited treatment options available to patients, and that engagement with a community activity, in itself, can be of value to participants. The positive experiences of the project participants, the media (photographs, video clip and magazine articles) and accompanying webpage on the Moorfields NIHR BRC website all support a potentially self-sustaining project community, going forward. The project has already encouraged other researchers at UCL to take part in public engagement, and Dr Gilbert, project lead, has been invited to become a member of the newly formed Public Engagement Committee to co-ordinate these activities at the Institute of Ophthalmology. The project team hopes other clinicians will be inspired to take innovative approaches with PPI/E, which could perhaps help meet the needs of their patients outside of the clinic. The website is currently being further developed to include a cookery day summary, more recipes and project updates. A similar project is being planned for later in the year. Meanwhile, other community kitchens have replicated some of the recipes and sessions. For further information, please visit the project website or listen to our interview with the project team.